napcabs is the professional partner in the installation and operation of high-quality sleeping cabins in secure areas of airports. napcabs provides airports with an optimal solution to offer passengers an improved level of comfort and a private space for the time they spend at the airport waiting for their flight. High quality in processing and in the materials employed as well, as the constant further development of the product are the benchmarks of the company. The air-conditioned sleeping cabins are manufactured in Germany and can be put into operation all over the world. The first cabins are successfully launched at Munich Airport. They offer passengers all the comfort they need for a quick time-out: Privacy, sufficient space for baggage, a comfortable bed, a table, a comprehensive, intuitive range of multi-media, as well as internet access and various light settings. An attractive design combined with efficient use of space make the complete cabin into some-thing which can quickly be positioned and installed wherever needed with the minimum of time and effort – especially in locations which otherwise have no other purpose. Whether they be for relaxation, for work or merely for a few hours’ sleep – napcabs sleeping cabins are the ideal product for the premium design of airport terminals. 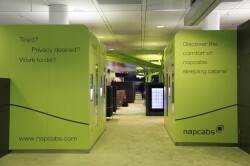 napcabs is operating sleeping and relaxation cabins inside airport terminals and for short-term use. The operational concept of these premium cabins is specially designed to meet the challenges of high security transit zones in busy airport terminals. Particularly where passengers have long stopover times or experience extended waiting. The operation of a napcabs sleeping cabin is based on a revenue share model without any financial risk for airports. napcabs are specially designed to meet the passengers needs, while they are waiting for their flight. Staying inside a napcabs sleeping cabin is the pleasant way to bypass stopover times between flights. You can find the latest information about the expansion of the napcabs as well as the napcabs concept at our website at www.napcabs.com and at our facebook fan page at www.facebook.com/napcabs. Discover the comfort of napcabs.